Hope these sweet desserts brighten up your January morning! I'm trying to amp up my baking skills and some lucky friends will get to be the beneficiaries of those tests. For this specific day I wanted to work on my frosting piping skills. We've piped frosting a few times before but Patrick has been the froster extraordinaire. Now I'm ready to step into the frosting spotlight! I debated coloring the buttercream for these cupcakes but decided I should focus on one thing and I had chosen piping. After some research I decided that the Wilton 1M star tip would give me the results I was looking for. I wanted something that would be impressive with just a few swirls around the cupcake. 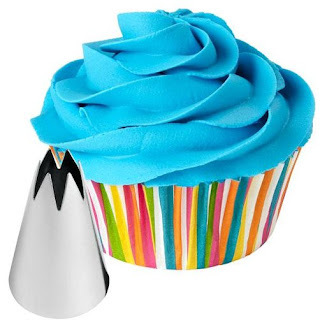 The Wilton website describes the 1M star tip as: "...another quick way to decorate your cupcakes or cakes. It just takes minutes to pipe a fancy iced swirl and add colorful sprinkles." After the cupcakes were baked and the frosting made I piped the frosting from the outside perimeter to the center of the cupcake. The lucky beneficiary of these cupcakes was a local friend who was celebrating her birthday a few weeks ago. We had them over for dinner and a game night complete with surprise birthday cupcakes. The remaining cupcakes went with Patrick to work. His co-workers may have a steady stream of sweets coming in over the next little bit. I tried a new buttercream frosting as well. It was from Betty Crocker's "The Big Book of Cupcakes". I chose it because it doesn't have shortening in it - the ingredients are simply butter, powdered sugar, vanilla, and milk. In large bowl, mix powdered sugar and butter with spoon or electric mixer on low speed. Stir in vanilla and 3 tbsp of the milk. On to the next trial - mixing frosting colors! Oh man, these look so good!